The Dell XPS 10 Tablet Manual is very important for each owner because provide many information for example about tutorial setting up tablet and troubleshooting guide. The Dell XPS 10 tablet has physical dimensions of 9.2 mm x 274.7 mm x 177.3 mm with weight are 623~633g. It has 10.1” WXGA with multi-point capactive touch and 1366 × 768 HD maximum resolution. The tablet is powered by 1.5 GHz dual core processor Qualcomm Snapdragon S4 Adreno 225. It's run on Microsoft Windows RT operating system. This tablet also equipped with 32/64 GB internal memory and 5 MP camera. In addition also support microSD up to 64 GB and powered by Li-Ion 28 Wh 2-cell mAH battery capacity. 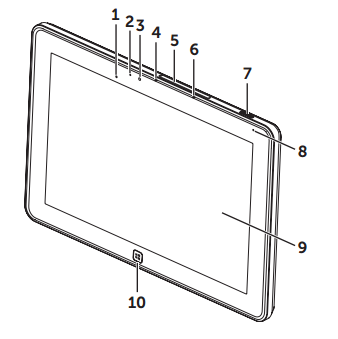 The Dell XPS 10 Tablet user manual is available in english language. It's consist of 47 pages. The manual contains reference information such as Charging the tablet, Turning On Your Tablet, Inserting a Micro-SD card, The Windows 8 Start Screen, Using Headphones, Managing Your Tablet Settings, Mobile Keyboard Dock Features, Charging the tablet and dock, Restart your tablet and more.